RBI – Relationship Building Impact! Special Operations: Mission to Win! Salespeople don’t want to be continually reminded about the sales basics they already know. The best salespeople, the most respected salespeople, always tell me they want to learn something new about their profession of sales. They understand the process of selling and they’re tired of hearing about what they mastered a long time ago. They want to hear about the latest developments in the field of sales. They want to understand how to use social media to penetrate new accounts. They want to understand how buyer’s make their decisions. They want to become better presenters and better negotiators. These subjects are not only fascinating, but also contribute to the continued success and personal growth of senior salespeople. Let’s face it. Sales can be a difficult profession. One of the most important aspects of every sales meeting is the care and feeding of the team’s mental health. This rejuvenation doesn’t come from a rah-rah let’s go get em’ speech. Rather, it’s the reassurance of knowing that you are not alone in your struggles and a certain amount of commiseration among colleagues is actually healthy. Most importantly, it’s imperative that your executives lay out the future plans to deal with today’s challenges in calm, cool, realistic terms. This is extremely important! While the marketing department goes to great lengths to provide customer success stories, salespeople want to hear the details and behind the scenes story about how and why they won the key deal. I recommend that salespeople are interviewed about their wins in an informal talk-show setting by an expert moderator. While this requires a great deal of preparation to be successful, it is the most critical part of the entire meeting. Life’s too short not to have fun and some self-deprecating humor should always be on the agenda. Put together a funny satirical video about a fictitious sales call. Assemble a rock band that can belt out some of the greatest hits from the 90’s. Create a skit about a TV show or play Jeopardy using questions about your products and company and attendees as contestants. Show that you don’t take yourself too seriously, have fun wherever you can, and make sure there’s a great cocktail reception where colleagues can socialize at the end of day! 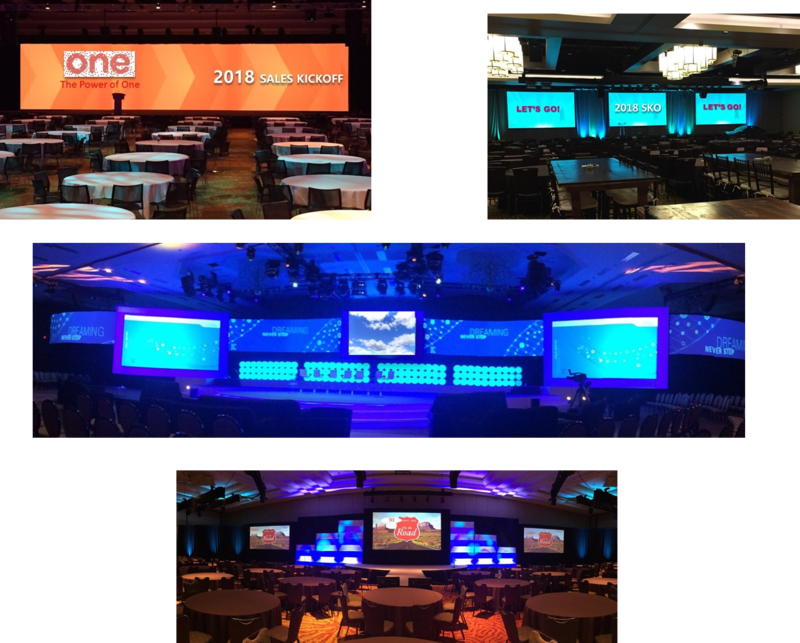 After keynoting hundreds of sales kickoffs and sales meetings, I’d like to share 5 critical Considerations that Determine Your Annual Sales Meeting’s Structure, Theme, Agenda, and Location. Sales organizations can be classified according to their maturity. Every sales organization can be classified based upon whether it is in a build, compete, maintain or extend stage. The build stage is when the sales organization is first establishing itself. If successful, it will proceed to a high-growth compete stage, and then to maintain stage that is contingent upon stable, predictable success. Because each stage encounters a unique set of challenges, the sales kickoff meeting goals, structure, and outcomes are completely different as well. The top sales challenge in the build stage is creating sufficient sales coverage and establishing a working sales model. Therefore, the focus of the sales kickoff is on learning the ever-evolving corporate presentation, studying the products, and building the organization’s sales intuition through extensive sharing of what’s working in the field. Most likely, this meeting will be conducted “assembly” style as one contiguous group and held the company headquarters or close nearby. Conversely, a sales kickoff for a maintain stage company is quite different. The focus shifts from scaling the organization to maximizing sales productivity by lowering the cost of sales and increasing the average sales price. The sales organization is fully staffed with more tenured salespeople. They are segmented by the size of the company they call upon and industry vertical sales specialists cover finance, government, retail, distribution, healthcare, and so on. As a result, the sales kickoff should be structured to meet the needs of each segment and add value from the standpoint of the senior salesperson. As a result, this meeting will utilize breakout sessions and be held at a desirable location most likely far from headquarters. In most industries, a single company controls the market. Compared to their competitors, they have a much larger marketshare, top-of-the-line products, greater marketing budget and reach, and more company caché. For salespeople who have to compete against these industry giants, life can be very intimidating indeed. The “push” versus “pull’ market characteristics that separate products dictate that completely different sales kickoffs be held. For example, salespeople from lesser-known companies must push themselves into new accounts by introducing their solution and its benefits to skeptical risk-adverse buyers (this requires extensive training and real-world knowledge transfer such as salesperson best practices panels). Conversely, salespeople from well-known companies are pulled into new opportunities because of their market position. Every sales organization has its strengths and weaknesses. For example, when B2B Buyer Persona Study participants were asked to evaluate the salespeople they met over the past year, only 54% could clearly explain how their solution positively impacted their business, only 31% are able to converse effectively with the senior executives of their company, and only 18% would be classified as trusted advisers whom they respect. The sales kickoff presents a great opportunity to focus on your organization’s specific weaknesses in order to improve overall team performance. Unfortunately, some sales organizations haven’t truly identified their weaknesses accurately or quantified them with precision. As a result, an opportunity is lost. That’s one of the reasons I like to conduct extensive pre-meeting research, sales rep interviews, and online surveys of the sales organization before I keynote a company’s sales kickoff. The missing agenda item at most every sales kickoff is an in-depth analysis of how B2B evaluators think and what’s really on their minds. What are their perceptions of the salespeople they meet and how do they ultimately choose between them? What are the dynamics of evaluation committee politics and group decision making? What are underlying psychological and behavioral tendencies of lower level evaluators versus c-suite decision makers? How do the different company departments (IT, finance, procurement, etc.) and vertical industries make their buying decisions? What are the circumstances that determine which vendor will be selected? This is the knowledge the sales teams crave. I published a fascinating research report on The Gap Between High-performing and Under-performing Sales Organizations which confirmed that high-growth sales organizations have a higher level of morale. What’s the level of your sales organization’s morale? Once again, the sales kickoff meeting provides a unique opportunity to make an immediate improvement. More than team building exercises or playing games, improving morale is a strategic initiative that consists of a series of planned messages and coordinated actions. The meeting location, theme, agenda, giveaways, and every presenter is a part of the morale improvement strategy. The only time during the entire year when the worldwide sales team gets together is the annual sales kickoff meeting. Obviously, everyone wants this meeting to be a success. As a keynote speaker who has had the privilege of presenting at more than one hundred annual sales kickoff meetings, I thought I would share some of the ways companies sabotage their annual sales conventions. German psychologist Hermann Ebbinghaus discovered people forget facts at a predictable rate and that the greatest learning actually occurs by studying less. His famous “Forgetting Curve” shows that meeting attendees will already have forgotten 80% of what they learned just two days before. You should keep this in mind when you are deciding on holding a three, four, or five-day sales meeting. State of the Union presentations about the company and sales, marketing, R&D, customer support and other pertinent areas of the company. Product-related sessions from the prospective customer’s point of view. Personal sales skills development sessions that address your biggest sales challenges and complement your particular sales cycle methodology. Sales strategy sessions based upon real-world win-loss studies and information. Motivational guest speakers and humorous presentations, video clips, skits, games, etc. Too many sales kickoffs are death by PowerPoint where presenter after presenter lectures the sales organization. These meetings don’t involve their salespeople in any aspect of the group presentations. Key salespeople should be asked to present summary overviews of their most important wins. For example, at most meetings when I keynote I will also moderate a panel that I call “Tales From the Field” where top salespeople are interviewed about their major wins and losses. There are three critical factors in determining location. First, how many airplane connections will it take for the majority of the salespeople to reach the meeting? Never select a location that requires three or more flights for non-international-based attendees. Second, stay away from “hazardous” weather locations during January through March (like the northeast or cities like Chicago). Finally, how much time, effort, and cost will take to get all your corporate presenters (and their demonstration equipment) to the meeting? This will help you determine if you should hold the meeting near corporate headquarters. Consider the following when selecting the hotel and meeting facility. How far is it from the airport? This forgotten factor is important because no one likes the hassle of flying all day only to have to shuttle for another hour or two to a hotel. The hotel meeting facility you choose also sends a message to the sales team. Is the company trying to send a message of austerity based upon the economic climate or do you want them to feel appreciated for all their hard work? Whatever your situation is, make sure the hotel mirrors the main messages being delivered by the senior leaders presenting at the meeting. No one has ever been fired for saying too many compliments or handing out too much recognition at a sales conference. Awards are extremely important because salespeople enjoy the acclaim and the public identification as a role model with their peers. Therefore, compliments to individual salespeople should be given out continuously throughout the sales kickoff and awards should always be done in full view of the entire organization. Let's assume you are in charge of planning your company's annual sales kickoff, the most important sales meeting of the year. You've picked the best location, chosen the right hotel, and are in the process of finalizing the meeting agenda. However, one critically important task remains to be completed--you must select the perfect keynote speaker. There are four main types of keynote speakers to choose from; celebrity, motivational, industry mavens, and sales experts. Celebrities (entertainment stars, sports heroes, business icons, politicians, etc.) will speak mainly about their personal experiences. Conversely, industry mavens are analysts who talk about current issues and future business trends. Meanwhile, motivational speakers exuberantly try to touch listeners' emotions and sales experts who share their wisdom and knowledge with the audience. Here are five questions to ask a potential keynote speaker in order to help you determine whether or not he or she is right for your meeting. 1. What is the profile of the typical audience you present to? There aren't any two sales forces that are exactly alike. Every sales force is unique in three different ways; complexity of the sales process, the average level of sales experience, and the state of morale. Perhaps the biggest mistake when selecting a sales kickoff presenter is picking one whose main message doesn't apply to the products you sell or resonate with the sophistication of the sales force. For instance, even though a keynote speaker has successfully presented to real estate agents in the past, he or she would not be a good fit to for a Silicon Valley software company. Ensuring that the speaker is in tune with the sales forces' morale is another critically important consideration. For example, if your company has been part of a recent merger you want a speaker who is familiar with the intricacies of this situation and how it affects morale. 2. How would you prepare for our meeting? The successful keynote presentation should include major messages that are applicable to the realities of your company's competitive situation. Therefore, the presenter should conduct extensive pre-presentation interviews and diligent background research to ensure he or she understands your marketplace, products, and salespeople. 3. Do you customize your presentation? Since salespeople present for a living they know when they are being fed a "canned" presentation. The most successful keynote presentation will incorporate elements of the salespeople's daily lives into the actual presentation. This may include tangible advice to defeat your archenemies and tactics to present your products more effectively. As a result, the presentation needs to be customized so that it helps address the toughest obstacles your sales force faces. A one size fits all presentation delivered exactly in the same way over the past five years has a high likelihood of falling flat today. Audiences appreciate a presenter who has taken the time to understand their challenges and provides them with strategies they can put to use immediately. 4. When do you typically present at sales kickoffs? At the beginning, a nightly dinner, or the meeting's end? You wouldn't use a screwdriver to hammer in a nail. Similarly, the particular speaking slot you are trying to fill requires a specific type of keynote speaker. If the speaking slot is at the meeting opening, you most likely want a powerful presenter with an impactful message (because he or she is probably speaking right after your company's chairman, CEO, or VP of sales). A keynote to be delivered during a dinner gathering should be fast-paced, up-tempo and include a healthy dose of humor. Conversely, a closing speaker needs to be able to rally the troops and reinvigorate them with a sense of purpose. 5. What takeaway materials do you provide? A typical keynote presentation will last just an hour or two at most. Given such a short timeframe, how can it be more than just a "feel good" experience? The best way to achieve lasting impact is by providing takeaway materials that the salespeople can reference over the long-run. That's why I'm a big fan of presenters who provide copies of their books, informational material, and their presentations to the audience. Finally, one of the most important factors you should continually remind yourself of during the selection process is how well does the speaker dovetail with your sales kickoff theme. The best speaker will center their presentation on your theme and work his or her material around it. If you're still not one-hundred percent certain what your theme should be, they should possess the practical experience to help brainstorm with you on an appropriate theme. Because the best speakers understand that your success and their success are intimately intertwined. Welcome – I recommend having a senior executive act as emcee for the entire meeting. This person will help keep the meeting on track, review the day’s agenda, and provide house-keeping instructions to attendees such as when and where to meet for events. Global Sales Review – Vice president of sales reviews the prior year results and discusses the successes, challenges, along with the goals for the upcoming year. Company “State of the Union” – CEO review of the financial and operational milestones achieved during the past year, perspective of the company’s future, and important developments within the industry. Marketing Update – High level update from vice president of marketing on new marketing programs, lead generation initiatives, industry analyst reviews, and market positioning versus the competition. 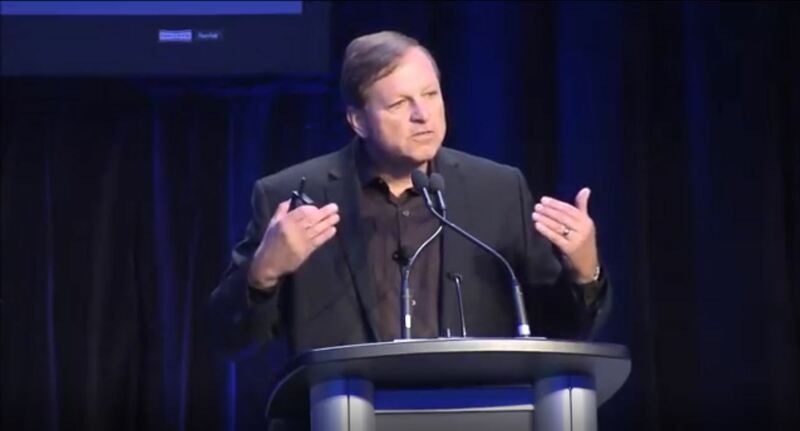 Guest Keynote Speaker – In this speaking slot, you want a powerful presenter with an impactful message that dovetails to the theme of the sales kickoff. Product Review – Updates on new products, enhancements to product line, and the future product road-map. Competitive Review –Analysis and comparison of the strengths and weaknesses of major competitive product offerings. Departmental Updates from services and support, consulting, training, partners and alliances, manufacturing, and sales operations. Cocktail Reception – An important bonding session where colleagues and old friends re-connect. Group Dinner – A sit-down dinner is preferable to buffet style. After Dinner Guest Speaker – A fast-paced, up-tempo sales-related presentation that includes a healthy dose of humor and some pithy take-away points (30 minutes). Awards Presentations for top salespeople, managers, and sales support recognition. Customer Presentation Review – Since the customer presentation is one of the most important moments in the sales cycle, it should be reviewed in its entirety to the sales team. Customer Case Study Reviews - This session involves a review of how the company’s solutions have positively impacted customers, along with strategies to leverage these stories in competitive sales situations. Ideally, this would include customers presenting their story or being interviewed. Salesperson Success Stories – One of the most important aspects of the sales kickoff is salespeople sharing the experiences about where they won and why. I recommend a salesperson interview panel with an experienced moderator as the best format to accomplish this. Buyer Behavior – The best sales meetings provide the salespeople with models of how customers make their buying decisions and the best way by which to manage the sales process. Closing Motivational Speaker – The closing motivational speaker needs to be able to rally the troops and reinvigorate them with a sense of purpose. CALL TO ACTION! – Vice President reviews key messages from the meeting and closes the kickoff with a Call to Action. Lunch – Buffet style lunch or box lunches to-go and attendees head home. CRM Training - This session helps sales teams use the customer relationship management system to maximize their time and account management efforts. Elevator Pitch Session - The elevator pitch is a concise message delivered to prospective customers that immediately differentiates you from your competitors. New Account Penetration Strategy - This session shows advanced techniques to reach new accounts through the use of email, direct mail, cold calls, and referrals. Product Demonstration Workshop - This is a technical session that shows how to customize a demonstration to emphasize product superiority and highlight distinct advantages. Technical Competitive Comparison - This is a comprehensive session on technical differences between competitive products that enables the sales organization to make and defend product advantage statements. Sales Skills Training - Salespeople don’t want to be continually reminded of the sales techniques they already know. They want to learn about the latest advancements in the sales profession for continued personal growth; appropriate topics include advanced sales psychology, sales linguistics, and sales intuition. Whiteboard Workshop - This session explains how to create rapport and gain the confidence of prospective customers through whiteboard presentations. Finally, I am not a fan of making sales kickoff attendees lug thick binders of material back on their airplane flights back home. Most likely the binder will never be opened again anyway, so put all meeting materials online. However, there are definitely a few things they should walk away with. First, a renewed sense of pride in the company they work for. Second, honest enthusiasm to get back into the field and ramp up the New Year. And finally, some positive thoughts and pleasant memories about the good time they had celebrating a career that is difficult, demanding, but ultimately, extremely rewarding. When I was a vice president of sales, one of my key responsibilities was to ensure that our sales kickoff was a complete success. Because it was the only annual gathering of the entire worldwide sales force, I wanted everyone to leave the meeting trained on our new products, well-versed about the competition, and most importantly, re-energized to get back into the field and sell. After participating in more than one-hundred sales kickoffs as a keynoter speaker, I can now attest that the first step toward conducting a successful sales kickoff starts with choosing the right theme. With this goal in mind, here are five factors to consider when selecting your sales kickoff theme. One of the most important factors to keep in mind as you chose your theme is the level of the sales force’s morale. All sales forces go through periods of high and low morale. When morale is high, you can be more creative and take bigger risks with the theme you choose. For example, one of the best sales kickoffs I ever attended was based upon the theme of “A night at the Oscars.” In advance of the meeting, each of the sales regions created their own video about the average day in the life of a salesperson. The videos were exceptionally well-done, full of side-splitting humor, and their ingenuity was inspirational. Everyone loved watching them and a judging panel of company executives awarded Oscars to the best. Conversely, I wouldn’t recommend such an over-the-top theme during tough times. In this situation the theme should be more commonsensical like “Better, Stronger, Faster,” which provides a platform that meeting presenters can use to talk about changes and upcoming improvements. 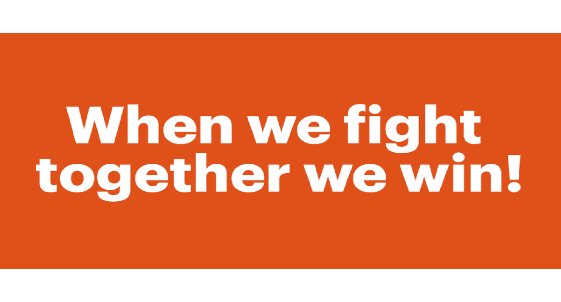 If you are in the midst of a merger, pick a theme like “Winning Together” that promotes teamwork, or something like “The Power of Synergy” that emphasizes how the companies combined are greater than if they were separate. Should the Theme Focus on Your Arch-Rival? Every company has enemies, and every sales force has an arch-rival that is truly despised. If you really want to rally the troops and concentrate the meeting’s focus, use a competitive theme that directly targets your arch-rival. For example, instead of an ambiguous theme like “In it to win it,” use the name of your competitor in the sales kickoff them like “BEAT ACME!” Remember, sometimes the most straight-forward theme is the best. Can the Presenters Dovetail to the Theme? The theme’s tagline is critical because it provides the centerpiece idea from which the meeting presenters can embellish upon. Recently, I attended a meeting where the theme was “Reach for the Stars” with an accompanying graphic of a rocket heading into space. It proved difficult for the presenters from the marketing, engineering, and customer support departments to incorporate into their presentations. A better space-related theme would have been “All Systems Go!” This would have enabled the presenters to delineate all the new products and improvement programs that were being launched in their area of the organization. It’s very important that sales kickoff attendees are provided three types of meeting takeaways. First, they should receive a welcome kit when they arrive that includes the agenda, ID badge, and gift that sets the tone for the meeting. Second, you should provide some type of sales skills self-improvement takeaway (a copy of book on advance sales strategies for example). Finally, always give company-logo’d chatska (T-shirts, hats, pens, mouse pads, etc.). Ideally, you would like your takeaways to tie into your meeting theme. 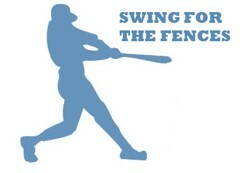 For example, “Swing for the Fences!” meeting attendees were given different colored company baseball hats and jerseys that designated which group they were part of for team-building exercises. Be sure not to skimp on the takeaways, because your annual sales kickoff is the most important sales meeting of the year. 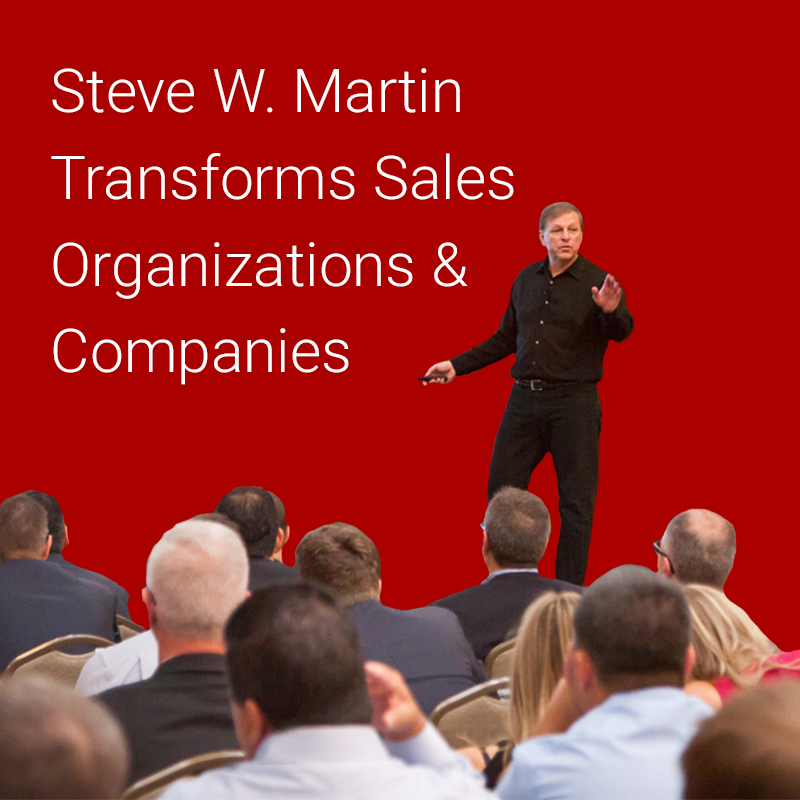 Whether speaking about selling to the C-level, sales linguistics, or high performing salespeople and sales organizations, Steve Martin is enlightening and entertaining. He’s helped over 150,000 salespeople become top revenue producers. Copyright © 2019 stevewmartin.com All Rights Reserved.